Now the question: Are there any resources (books, Web sites) that might teach me so that I easily understand what computer (program) recommends and how it evaluates the situation? If a player wins, he gets 1 additional point, if he draws he gets 0.5 additional points and if he loses he gets nothing. Res. = Results against the other players with whom that player is tied. Vict. = Victory - This is the number of won games by this player. This is a scoring system often used to break ties in chess tournaments. The player with the highest score and most Sonneborn-Berger points will be the winner. 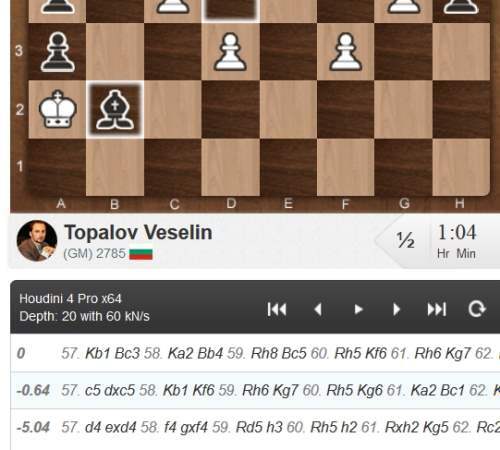 The chess engine Houdini runs in the background and evaluates all possible moves that can be made in a specific position during the game. It shows the best three lines. The first line shows what it considers the best move. In the image above you see three variations starting with a particular move. This move is valued by a little number on the left. If this number is going into plus (for example: +0.56) then the position will be better for White if this move is made. If the number goes into minus (for example: -0.87) then the position will be better for Black if the first move in this line is made. The move shown in the first variation on top is always the best one. The others are just alternative moves and often very bad and not recommended. But you should give the program sufficient time to find the best move. Sometimes this can take up to a minute or so, depending on the complexity of the position. Normally the best move shows up in the first line after a few seconds only. In the image above the best move for White is 57. Kb1. The alternative move 57. c5 in the second line is better for Black because it shows a negative number (-0.64). In the third line you see a very bad move (57. d4) that loses for White as it shows a high negative number (-5.04). This means Black will get a very big advantage and is winning if this move is played. Generally you can say that when the number in the first line (which is usually the best move) goes higher than +1.00 then Black is losing. If the number goes lower than -1.00 then White is losing. This shows how deep and how quick the program calculates. The Depth is calculated in half moves. A half move is when White or Black makes a move. A complete move is when White and Black makes a move. Example: 1.e4 e5 is a full move. 1.e4 is a half move. 1...e5 is a half move. In this case (see image above) the engine calculates 20 half moves in 60 kilonodes per second (kN/s). A “node” is a board position, a “kilonode” are thousand positions. So the chess engine Houdini 4, which runs in the background to evaluate the actual position in order to find the best move, calculates sixty-thousand board positions in one second. Thank you very much, this is brief and explains a lot. Was really helpful.